This is a great quantity of .40 Smith & Wesson for the avid shooter who needs a good bulk case lot to reduce costs, but still wants a convenient transport to the range. 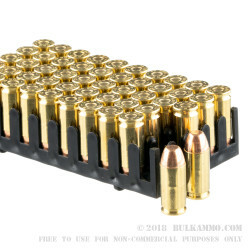 This is a 5 tray container of 50 rounds each – so 250 rounds in one rectangular box. Easy to transport and easy to justify, given the excellent price point. 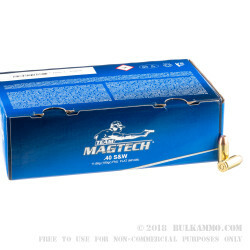 This is a MagTech branded ammunition from the CBC Group which is one of the leading producers of ammunition in the world. The clean burning powders offer great functional reliability without a bunch of extra cleaning hassles. The top tier reliability of the factory loads out of the MagTech facilities means you get a surprisingly good value from this ammunition. This is a 180 grain lead flat nosed projectile with a full metal jacket and it offers excellent feeding reliability and an exceptionally low failure rate. 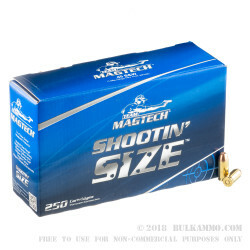 A near perfect range round given the price point, this is the type of ammunition you want to be using for local competitions due to the good price, great accuracy and exceptional reliability. 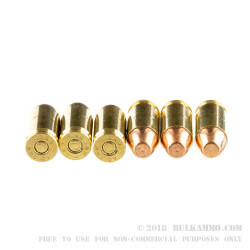 It’s also the type of ammunition that makes sense for those hand loaders, because the gorgeous brass is top quality and the price of entry for reusable brass makes it a no-brainer. Boxer primed, Brass cased; reloadable and packages as a single box with 5 trays of ammunition for a total of 250 rounds.